Style is never boring when you wear mens fashion blazers by Zacchi. Sure you can wear something ordinary but when you want to make a style statement, a fashion blazer by Zacchi is always a fun choice. 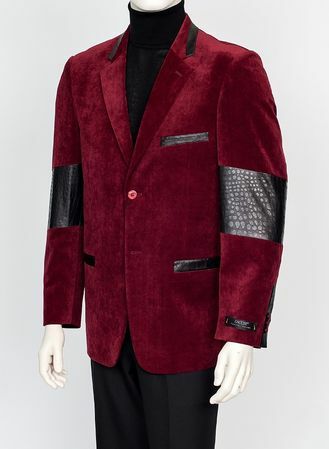 This burgundy color blazer is made of a brushed cord fabric that is similar to velvet with the addition of crocodile texture trim on the pockets and sleeves for a fashion forward look. Regular fit.